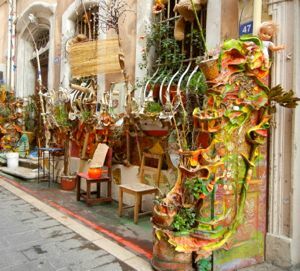 The oldest part of Marseille, the Panier district is a great place for a stroll. Ancient Massalia, from which Marseille took its name, was located in the district now known as Le Panier. After significant bombing of this important port city during World War II, Le Panier is the only part of Marseille to remain relatively intact. Its narrow, twisting streets—which sometimes lead into staircases—its window boxes and cafés make it a pleasant place to wander and relax. Chances are you'll get lost at some point, but you can't go too far astray, so just keep wandering. In recent years, Le Panier's mix of residents has changed from middle class to working class, with a large number of immigrants. You'll find yourself in an international village, with a variety of languages and cultures represented, as you might expect in a major Mediterranean port. Le Panier is home to the Centre de la Vieille Charité, which today houses museums and hosts special exhibitions. Built in the 17th century to serve beggars and indigents, it later became a center for needy children and the elderly. The city of Marseille restored the beautiful complex of buildings in 1986. While you're in the Panier district, you might want to take a look at the Cathédrale de la Major, which is just outside the district and easily accessible on foot. 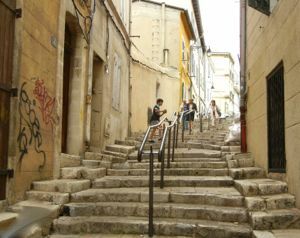 Above, Typical street/stairs in the Panier district of Marseille. Below, Colorful street display in the Panier district.